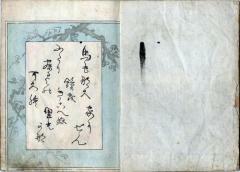 "The four volumes of the same artist's Shiki no Nagame, 'An appraisal of Sensual Pleasure', also no doubt published in the 1830s, are a truly remarkable production, distinguished not so much for the designs, which follow a fairly predictable pattern of generally violent love scenes, portrayed with a coarseness all the more repellent on account of Kunisada's skillful realism, but for the amazing technical brilliance of the print-makers..."
Quoted from: The Art of the Japanese Book by Jack Hillier, vol. 2, p. 901. Page #4 in the Lyon Collection is illustrated in Hillier on page 903, pl. 175.